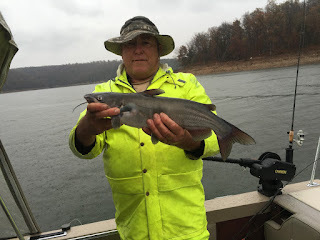 Norfork Lake fishing has been OK over the last 2 weeks. All species are biting once you find them. Large schools of stripers, hybrids and white bass are cruising the lake feeding on shad. 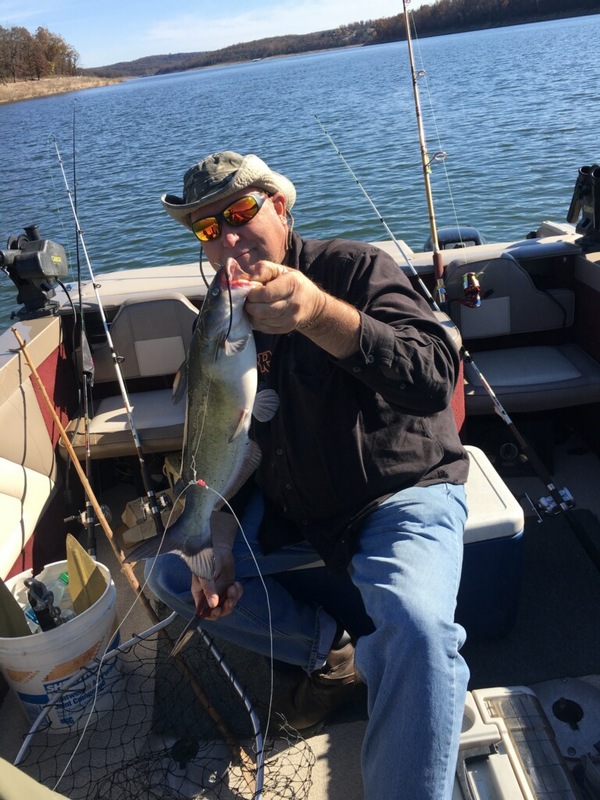 Crappie and bluegills are hanging around brush piles and largemouth, smallmouth and spotted bass are starting to move to the banks, but a lot of the larger bass are still suspended chasing shad. Catfish are hitting worms and small bluegills very aggressively. 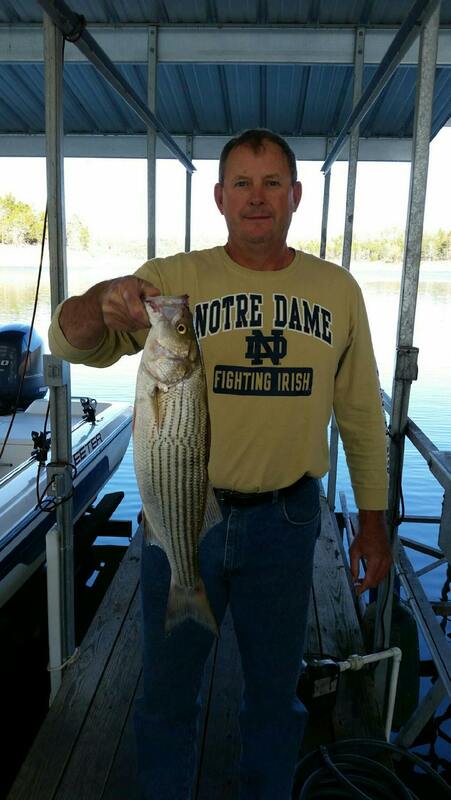 Stripers, hybrids and white bass have schooled up and are starting to fatten up for the upcoming cool winter months. You can find large schools of fish roaming large flats in 40 - 50 foot depths. I have been vertical jigging with a spoon. It does take some time to locate the fish, but when they are found they're a lot of fun. The biggest challenge has been that as I find them and catch a few, the school swims off and I'm back trying to locate them again. I have also found large schools of stripers in the mouths of coves, late afternoons in 70 feet of water suspended 20 - 30 feet down. 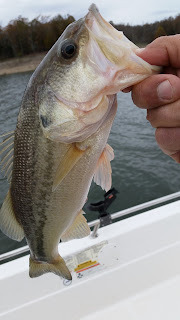 Find a cove that the wind is blowing directly into, then if you find suspended bait start looking for the stripers cruising and feeding. For some reason these large schools of stripers are hitting my spoon only when I reel up through them. Trolling is also working in the afternoon. One of my stripers this evening came from trolling a swim bait about 20 - 25 ft down. Not a lot of change in largemouth bass fishing from my last report. I am still catching these fish in 27 - 33 feet of water. Work a jig and pig or any plastic bait along the bottom. I have been casting out my spoon and bouncing it back to the boat along the bottom, this method is catching some nice fish. I am starting to mark some nice suspended bass along bluff lines down about 15 - 20 feet. Crank baits should start to work before long. 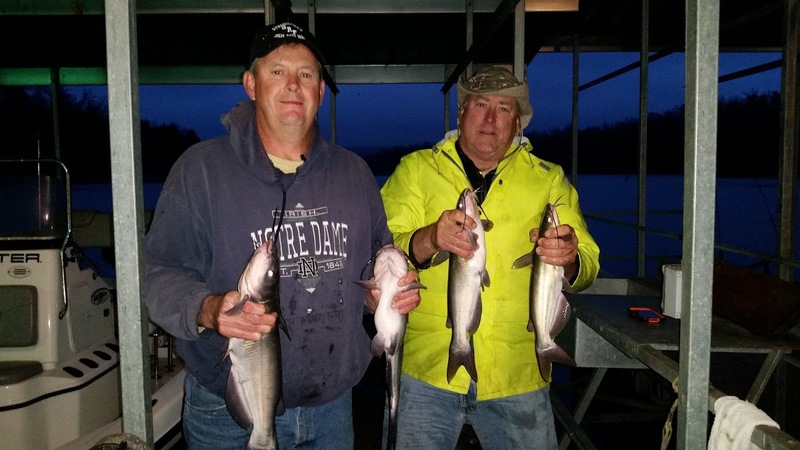 Catfish are biting very good on green worms and small bluegills. Jugs & trotlines are working the best. Some crappie and bluegill can be found in and around sunken brush piles 25 - 30 feet down. The fish will be suspended over the brush, but mid day look deeper in the brush. Small grubs or a small spoon jigging in and around the brush will catch you a few nice fish. Crickets are the best for the bluegills. The lake level is holding fairly stable and currently sits at 553.23. Sporadic power generation is occurring during the day. The surface water temperature is falling slowly and current is 63 - 64 degrees. The main lake is clear and the creeks and coves are still stained.